In our great city, you don’t need to look very far to find great things being done by great people. In fact, we have so many active do-good events that sometimes they are overlooked. 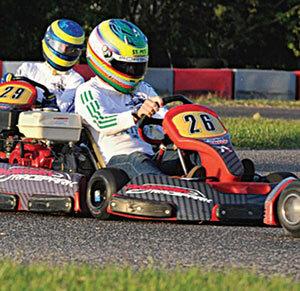 One of the world’s auto-racing greats, Sébastien Bourdais, lives in the Shore Acres area, and has quietly worked with a growing group of volunteers to create an amazing charitable event which has grown exponentially each year since beginning in 2012. 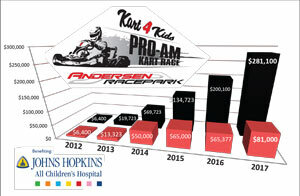 Benefitting Johns Hopkins All Children’s Hospital, the Kart 4 Kids Pro/Am Kart Race is an awesomely unusual opportunity to race 12hp competition karts against internationally known professional race car drivers. Imagine the adrenaline drivers feel, speeding down the track at nearly 50mph, competing alongside their favorite professional race car driver. As with many ideas, the event got its start between two friends over a cup of coffee several years ago. The basic idea was to celebrate the racing legacy of fallen champion from St. Petersburg, Dan Wheldon, with an event that would benefit a cause near to his heart. The idea was hatched. Why not create an event where professional drivers and amateurs can mix it up on the track while raising money for All Children’s Hospital? Of course, it just so happens that our city hosts the perfect event for tapping some of the biggest names in racing, the St Petersburg Grand Prix. One of those coffee-drinking dreamers is local businessman, professional racing enthusiast, and Porsche Club of America member, Page Obenshain. Within moments of meeting Page, one is struck by his easy conversation and relaxed demeanor. For that first event on short notice in 2012, auto racing great, Patrick Long, graciously agreed to be the one-and-only professional driver. 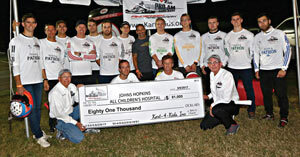 With just six short weeks of planning, the fledgling event attracted 40 amateur drivers and more importantly, raised a very respectable $6,400 for All Children’s Hospital. 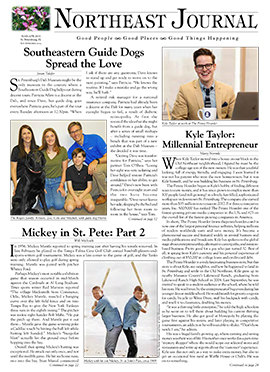 Word spread, the committee grew, and in the second year a few big name sponsors were recruited to support the event, explained Page. These included Alegra Motorsports, Bert Smith Porsche, and Reeves Import Motorcars. In attendance were 10 pros and 40 amateur drivers. The event benefitted the hospital with a total of $13,400. Organizers were encouraged and vowed to continue to make it a bigger and better event with each successive year. The excitement was contagious it seems, and more sponsors were willing to support the cause. In 2014, Patrick Long agreed to lend his name to the event, increasing the star power to attract further support. More sponsors signed on, including Patron Spirits, Rally Gas Stations, and Dale Pelfrey Racing. The event scored a cool $50,000 on behalf of All Children’s, becoming their single largest third-party fundraiser. 2015 brought increased sponsorships by Patron and Rally, as well as new sponsors Cardio Access and Porsche North America. Very importantly, Andersen RacePark became a major sponsor, instead of just the location of the race. When the dust settled at the end of the day, $65,000 was raised for the hospital. In 2016, Beall’s Department Stores and Tervis Tumblers provided some fabulous gifts for the event participants. New sponsors, CSI Construction Services and Parathyroid, were added, and despite a conflict of events in the racing world, a total of 14 teams raced. The event scored another $65,000 for All Children’s Hospital. All told, the event delivered just over $200,000 in five short years. In 2017, they made it even better. With both Sébastien Bourdais and Patrick Long acting as event chairmen, the star power continued to expand. Patrick has supported the event since its inception and deserves thanks and praise for his commitment. It is worth noting that as part of his professional driving history, Patrick met Dan Wheldon when they were both aspiring race car drivers racing karts in the late 1990s, and continued as friendly competitors until Dan’s deadly accident in late 2011. In addition to the international driving stars, the official committee consisted of two event co-chairs (not professional drivers), local Page Obenshain and fellow Porsche Club of America member Dave Bassett, as well as 17 more committee members. Unofficially, it takes an army to turn out an event as special as this one. In conjunction with Grand Prix of St. Petersburg for the first time, the event was held on March 8th and this time netted $81,000 for All Children’s Hospital. The race itself is a 75-lap enduro-race where a team of four amateurs are paired with one or two professionals. The professional drivers start the race, the amateurs drive a minimum of eight laps each, and the pros finish the race. To begin the race, the professional drivers participate in a LeMans start, which is a veritable footrace across the track by the professional drivers fully suited and helmeted. Some non-racing types choose to donate the amateur spot they sponsor, which would be a great windfall for any frustrated minivan driving mom or cross-county commuter who rarely shifts out of second gear. In addition to paying for an amateur driver spot on a team, many opportunities for support are available. Business supporters can purchase advertising in the form of track signage, donate items for the auction, or write a check. Having Johns Hopkins All Children’s Hospital here in our community is part of what makes our neighborhood great. The people who choose to support it are also great. Page Obenshain resides on the northeast side of St. Petersburg with his wife, Lee. Professionally, Page is in the yacht-brokerage business as owner of St. Petersburg Yacht Sales & Service. Personally, he loves to spend the day on the water with his grandkids.